There have been a number of reports recently of laptop computers, containing personal information which have been stolen from vehicles, dwellings or left in inappropriate places without being protected adequately. The Information Commissioner has formed the view that in future, where such losses occur and where encryption software has not been used to protect the data, regulatory action may be pursued. The ICO recommends that portable and mobile devices including magnetic media, used to store and transmit personal information, the loss of which could cause damage or distress to individuals, should be protected using approved encryption software which is designed to guard against the compromise of information. Personal information, which is stored, transmitted or processed in information, communication and technical infrastructures, should also be managed and protected in accordance with the organisation’s security policy and using best practice methodologies such as using the International Standard 27001. At Inspire ICT we provide a complete encryption service where we secure all notebooks/laptops and more sensitive desktop pcs. 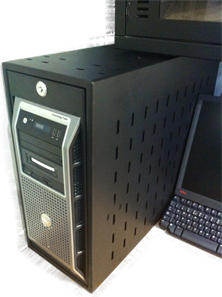 We also supply and install security cages to anchor servers and other pcs to prevent data loss. We take data security very seriously and only supply hardware encrypted removable media such as USB hard drives or flash drives. If you’d like us to quote on any of the above security measures please contact us. Server security - Made to measure secure steel cages to secure servers of all sizes to the floor, wall or to a desk. Desktop and laptop security - we supply physical security products to protect workstations and notebooks as well as software encryption to ensure the data held on the computers cannot be stolen and misused. Our physical security products range from lock cables to toughened steel cages and desk clamps.